« *** WINNERS *** Janet and Kimmie are Living the Life of Riley! CONGRATULATIONS! Since the dawn of time, man has been searching for the fountain of youth, and although we have yet to find anything which prevents us from dying, we have found plenty to make us appear as if we've virtually stopped aging. Our skin care regimen and the beauty treatments we choose to undergo can significantly improve the way our skin looks and feels and can take years off of our face. Since I was not blessed with good skin, I admit that I've been undergoing skin treatments at the spa for years now. I love the improvements to my skin that I see, but I hate the high price tag associated with them! That's where PMD Personal MicroDerm comes in. They claim to deliver professional microdermabrasion results in the comfort and convenience of your own home, for a fraction of the cost. Keep reading to learn more! I reviewed the Personal MicroDerm System (PMD) System, which retails for $179.99, but is currently on sale for $167.00 with FREE SHIPPING. I've personally underwent many beauty treatments for my skin, but never on a regular basis or schedule. Usually, whenever a great Groupon deal came around, I would partake in a professional treatment, such as a microdermabrasion, but I never dreamed that this could be accomplished at home in regular intervals. 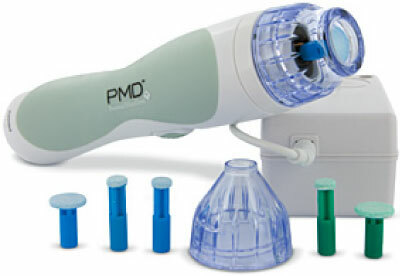 The PMD Personal MicroDerm is a simple, handheld tool that enables you to achieve professional microdermabrasion results, not only on your face, but also on your chest, hands, elbows, knees, etc. Now you can have gorgeous skin and rid yourself of problematic age spots and scars anywhere on your body! The tool is easy to use too. Basically, you test a small sample of skin on either your arm or under your jaw to discover whether you have sensitive skin or more resilient skin. My skin is extremely resilient, but it is still important not to hover on one area of your skin. Grinding in one area can cause scabs and scarring, which is the exact opposite of what you're trying to achieve, so remember not to overdo it. You want to glide the PMD across your skin in short strokes in one direction, like a vacuum. The great thing is that you can easily see where you've used the PMD tool because you will either see slight pink colored skin or a white flaky streak of dead skin. In order to use the PMD Personal MicroDerm, you just plug in the tool to an electrical power source and then select the appropriate tip. Your system comes complete with two small blue tips, one large blue tip, one small green tip and one large green tip. The blue tips have a slightly smoother grit to them, making them perfect for sensitive skin or for use on the face. The green tips have a grittier texture, which should be used on the body or gradually worked up to on the face. The large tips are perfect for large areas of skin, such as your cheeks, forehead, chest, hands, etc. The small tips are what's necessary for the harder to reach areas like around your nose or between your eyebrows. It is recommended that you perform a complete microdermabrasion using the PMD every 5-6 days for a total of 12 weeks. This regimen will give you smoother, rejuvenated skin and rid you once and for all of those pesky age spots and sun damage. After using for 12 weeks, you are encouraged to use this system twice per month for about 3-4 months and then just once per month after that for maintenance. Since microdermabrasion helps to retexturize your skin, smoothing away fine lines and wrinkles, lessening acne scars, etc., I can't wait to complete the 12 weeks of treatment to see the results for myself. I had the chance to complete one treatment using the PMD Personal MicroDerm and have to admit that this tool couldn't have been easier to use. Simply clean your face thoroughly before use and then pull the skin taut between your fingers as you move the PMD across in one smooth motion. Within minutes, I had finished with my face's skin. Next, wash and dry your face again, making sure to apply a good toner to neutralize your skin's pH as well as a regenerative moisturizer. Make sure to clean your PMD thoroughly after using so as not to damage the unit from excess dead skin. Since your skin will be much more sensitive to the sun for the next several days following a treatment, make sure to apply a high-SPF factor sunscreen to protect your new layer of skin. Then, in 5-6 days, repeat these steps again. It truly couldn't be easier to see real results! My skin looked and felt great and had a whole new healthy glow to it. I also thought that some of my acne scars looked smoother and a little less defined. What's great is that you can now have a professional microdermabrasion in the comfort and convenience of your home for a fraction of the cost of a spa treatment. The only consumables with this system that will need to be replaced are the blue or green replacement discs, which are extremely affordable. If you'd like to see wonderful professional results without the professional price tag, then I highly recommend the PMD Personal MicroDerm System! Disclosure: I received the Personal MicroDerm (PMD) System in order to facilitate my review. No other compensation was received. This product review is based on my own personal experiences with this item and is completely honest and objective. Hi! I am your newest follower from the Bee Friendly Blog Hop! I would love to have you follow back!